Another love-at-first-sight flowering plant that was added to our garden in late April 2006. Within a couple of months, it grew into a very attractive compact bush with lots of dainty-looking tubular lavender-purple flowers in lovely batik design. Very showy and incredibly fascinating! We got to enjoy its profuse flowering for about half a year until it gave up on us before that year-end. Probably, as a result of too much sunlight or overwatering or even excess trimming in our haste to propagate new plants? We really couldn’t pinpoint the cause of its demise! Plant type: Herbaceous ornamental shrub. A Plectranthus hybrid developed at Kirstenbosch Botanical Garden in Cape Town, South Africa by Roger Jaques in the late 1990s. Features: Plectranthus ‘Mona Lavender’ is a beautiful hybrid of parentage P. saccatus (seed parent) and P. hilliardiae (pollen parent) of the genus, Plectranthus. A herbaceous and bushy perennial with a rounded, erect and upright growth habit. It is a vigorous grower and can typically grow to 60 cm (2 ft) or slightly more in height and width, but more compact in sunlight. Foliage is evergreen and attractive, with glossy dark green ovate leaves (roughly 5 x 2.54 cm) that curl slightly and have scalloped margins and lovely deep purple undersides. As stunning are its dainty and tiny tubular two-lipped flowers held in great abundance along numerous tall and erect dark-purplish spikes, more than 18 cm (7 in) long. Blooms are lavender in color and wonderfully speckled with purple markings that seem so exquisitely patterned as some batik fabrics or orchid species! It is a prolific bloomer and flowers over a long period throughout the growing season, especially in shortened daylight or shadier conditions. Primarily grown for its very showy flowers, it is now popularly and widely cultivated worldwide, in the tropical and subtropical regions, and even as an annual or tender perennial in the temperate regions, due to its easy culture. Culture (Care): P. ‘Mona Lavender’ (Lavender Spur Flower) is easy to grow, relatively fuss-free and rewards handsomely with non-stop flowering. Light: Best growth in filtered sunlight or semi-shade, but can tolerate full sun (not too strong and harsh though) or full shade. Moisture: Water regularly, especially during hot and dry seasons. Be mindful though, not to overwater which could lead to shedding of leaves prematurely. Soil: Grows best in moist, humus-enriched, loose and well-drained soil. Others: Prune lightly after flowering to maintain neatness and compactness, as well as to encourage denser branching and hence more blooms. Or alternatively, pinch back new stem tips regularly to induce more branching and maintain compact form. Spent flower spikes should be removed. Feed fortnightly with a balanced liquid fertilizer. If a granular fertilizer is used instead, place them away from the crown and water in well to avoid burning the tender roots. No serious insect or disease problems, though do watch out for mealy bugs and mites. For temperate regions: Hardiness: USDA Zones 9b-11. ‘Mona Lavender’ is not tolerant of very cold conditions, so should be protected from winter frost and freezes or overwinter it indoors. Plant it in spring if your area is affected by heavy frost otherwise anytime of the year will do for non-frost region. Blooms prolifically from autumn to early summer, when provided with proper culture. Propagation: Easily propagated from herbaceous stem cuttings or tip cuttings that root easily in soil or water. Usage: Plectranthus ‘Mona Lavender’ is an excellent border or bedding plant for annual or perennial garden, either planted en masse, as specimen or in mixed plantings. Very ideal in raised planters, containers or hanging baskets to display its colorful beauty at decks, patios, garden porches, windowsills and balconies. 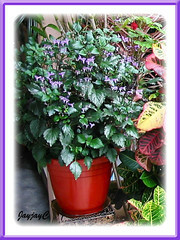 Also, it can be grown as a houseplant in bright or shaded sites, and in greenhouses or conservatories. You can even take some stem cuttings including the flowering spikes and use them as floral display in a vase filled with water – not only one get to enjoy the long-lasting blooms, but the cuttings will eventually root and can be propagated as new plants for oneself or presented as gifts. Isn’t that lovely? 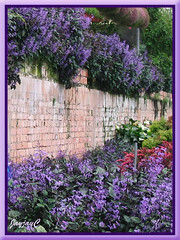 Sharing photos of potted Plectranthus in abundance at Cactus Valley, Brinchang in Cameron Highlands. 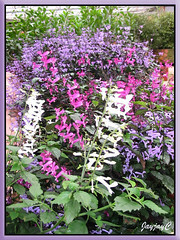 Left image is the popular Plectranthus ‘Mona Lavender’ in lavender, while the right image included two others, flowers in white and magenta pink. These two cultivars do not have leaves with purple underside as with ‘Mona Lavender’. Most frequently seen in garden nurseries in the lowlands is the lavender variety. In fact, it was our first sight of white and magenta flowers…probably these aren’t as hardy as the ‘Mona Lavender’? Been busy lately so did not have much time to visit your website. But upon opening your website, saw this same lovely plant that I’ve just bought a few weeks ago. Sad to say that the plant is not doing very well. The plant is wilting away. I’m trimming the wilting parts trying to save it. Crossing my fingers! Thanks for dropping by, YenLing! 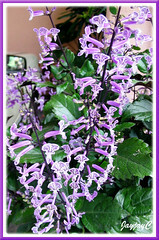 Hope your Plectranthus will survive from whatever stress it’s encountering and give you much delight. I’ve just discovered and purchased four Mona Lavender plants and found your site very informative & helpful! I’m hoping to plant around my mailbox but it does receive full-sun. What do you think? Thanks for the positive comments on our site, Gena. If your intended site for the plants receive full sun for many hours including the midday and harsh afternoon sun, I think it could be quite damaging on the foliage. Best is sunny and semi-shaded locations. I’ve been growing Mona Lavender Plectranthus in my garden for a over a year and it does beautifully as a border in front of my hydranges mixed with a plant derived from the Australia native species Plectranthus parviflorus, ‘Blue Spires’ has rounded felty green leaves with a creamy white edge and produces spires of pale blue to violet flowers from spring through autum. its a great combination. Hehe..I had to google-search to know how ‘Blue Spires’ look like. Its variegated leaves are fabulous! I can just imagine how beautiful your border will appear with those lovely combination. Thanks for sharing, McLaren. I just bought 2 packs of 4 plants each, and they are growing so bushy and look so healthy. I’m just wondering when they start to bloom. 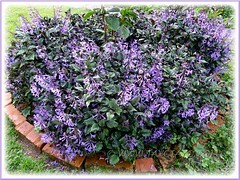 I always have the Variegata plectranthus which looks like swedish Ivy but I don’t think it will flower. Hi Lois! We’re in Kuala Lumpur, Malaysia. All the best to your new purchase! Lois, I live in Indiana, zone 5. I have had a mona lavender for 3 years now. I bring it in in the winter. Then take it back outside in the summer. I leave it in a pot, I have never put it in the ground. I have planted Mona Lavender in semi-shade sites along the driveway & on a corner lot. It have bloomed beautifully with all the purple flowers throughout Fall. I bring a few plants inside in the cold weather. They grow easily outside after frost date, in containers. Get lots of praises about the purple leaves and spikes of purple flowers. I bought this plant in july as a hanging and SWORE it would be the first i did not kill. It is january. So far so good. How many times a week should i water it though now that i have brought it in for winter? I am in the midwest so snow and frost are a give in. Thank you in advance! I bought a Mona Lavender last fall and planted it in a shady bed where it does get morning sun. It looks so beautiful this summer. It hasn’t started to bloom yet this year but I am looking forward to it’s beautiful purple flowers. I was glad to learn that I could take a cutting and it would root. I plan to start about 4 or 5 more for different areas of my yard. All the best to you, Vickie Jewell! May the seedlings flourish and reward you with plentiful blooms! I picked up two of these yesterday. Like many others, I had never seen or heard of it before, but I could tell by the look, feel and smell that it was a type of mint. I fell instantly in love, and bought two ENORMOUS hanging baskets, very inexpensive. I was so happy to see they grow and bloom indoors, because winter is coming :) I’m in Connecticut, zone 6, planning to relocate ASAP to south Florida. I hope I can bring these with me and propagate them. I’m already imagining my new beautiful gardens. Wish you all the very best with your recently purchased beauties and your move to South Florida, Melody! I just bought a beautiful hanging basket of Mona Lavender. So happy to hear that I can bring it indoors and it will survive the winter. Any hints to help keep it healthy during the indoor months? I live in upstate N.Y. and it’s a long winter! Other plants have just dropped their leaves and given up when I try to keep them inside for the winter. Jacq, would you be so kind to share where one can get the lavender plant in KL? Cameron I assume? Hi Adrian. Try any garden center or superstores that you usually patronize in KL, you may be able to get them there as plants are delivered on seasonal basis when available. 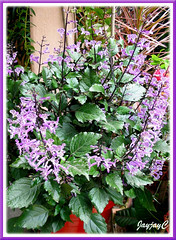 In fact, I’ve even seen some potted Plectranthus on sale at Tesco Extra Cheras, Jalan Midah, KL on Tuesday, just a few days ago. Best to get these plants in KL as those from Cameron Highlands do not normally thrive well as they need to acclimatize to our lowland heat. I love these photos. They are exactly what I have been looking for. Pat, please check your email… we’ve sent you a reply. I recieved a mona lavender about 2 years ago, and now it is growing all over the place. Is there a safe way to prune it back, or will that kill it? Sorry Sandy, we’re unable to advice as we’re in tropical Malaysia. You may want to hop over to Dave’s Garden to read some relevant tips from temperate gardeners in similar USDA Zone as yours. spikes were coming off almost by themselves. Testing to see whether the comment box works as a site visitor sent an email to notify us that it didn’t work for her. We’re surprise… it does work excellently??? Hello. I have a pot of mona lavender. I realised that it is starting to loose the purple underside (leaf). What is happening? How should I care for it? Thanks. Sorry Tricia… we have no clue what is causing the purple underside of leaves to start losing its colour.